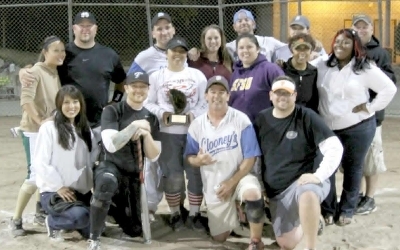 Welcome to Clooney's Pub Softball, a slow pitch softball team located in Burlingame, CA. We've been playing together since March, 1996 and began our 17th year playing together in March. We've progressed into a pretty decent team, with 19 playoff championships and and 29 league titles. Still, we try to have fun along the way (someone once said that we were a "DRINKING TEAM WITH A SOFTBALL PROBLEM"). 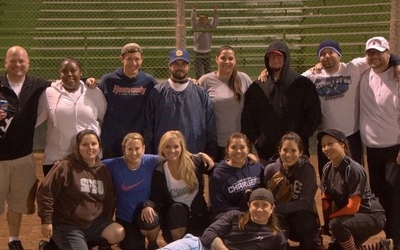 In 2011 we began playing Co-Ed on Monday nights in San Mateo and currently have two teams active on Monday. Our only remaining men's team is our Backward's K squad in Foster City on Thursday nights. We have three sponsors: The Dan Lyons Team w/Keller Williams in Burlingame, Clooney's Pub in San Francisco and The Patio Bar in San Carlos, with The Patio Bar the home of our semi-regular gatherings. While our core softball teams now play in San Mateo & Foster City, at one time or another we've put teams into Burlingame, Millbrae, San Bruno, San Carlos, Palo Alto, Redwood City, Belmont & Twin Creeks (Sunnyvale). Really, the only local cities we haven't tried are San Francisco & Daly City.